But anyways…on to our dystopia! Lesson four: Never let yourself be Enhanced. Once it’s done, there’s no going back. So anyways this is Dream Stalker: Talented Book 1 by Amy Hopkins. It follows a half-blood named Emma who runs a tea shop in London. Not just any teas though, she sells teas enchanted with her limited magical ability and has slowly eked out a small name for herself. All she wants for herself in a peaceful life. Unfortunately, as a half-blood, that is a little more difficult to come by. I must start off by saying that I received this book for free in exchange for a fair and honest review. I think I am starting to see a trend here…I feel like this blog is becoming a “Jeffrey Cook Review Blog” or fan blog. I didn’t mean for this to happen, but is it really my fault if he is writing some good books? (No, the answer is no.) That being said, I think that this will be my toughest review to write so far. This book left me in a blubbering, unattractive mess by the end. It was beautiful. The book that is, not my blotchy and snotty face. So I’m not entirely sure if it is a little uncouth to review books by the same people twice in a row, but well…here you have it. I promise though, the next review PROBABLY won’t be a Jeffrey book. Maybe. Okay, I probably shouldn’t make promises because he has too many books that I need to read. Honestly, I loved this book. So, I know that a few months ago I assured everyone I would be getting back into the swing of writing my book reviews….and then I didn’t. Oops! Life happens I guess (lol). HOWEVER I am back because there is a review I MUST write. Seriously. I have to. If you don’t want to read the whole review, this is the blurb: It’s a bloody damn good book. READ IT. Now, I’m no coward. I wasn’t running so much as luring the Ifrit to a larger section of the museum where I would have more room to maneuver. It’s called tactics. So now I am behind on my book reviews, but hey…that happens right? At least I am attempting it (lol). 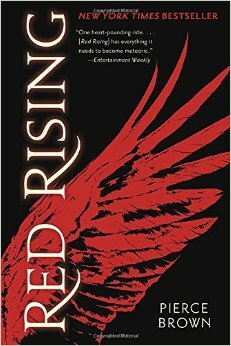 I have had Red Rising by Pierce Brown on my “to-read” list for awhile, over a year at least. I kept putting it off because…well….the thought of a story on Mars was a bit of a literary turn off for me. I have only had three books that take place in space actually catch my attention, most are too sci-fiy and roboty for me. (If you are wondering, the three are Ender’s Game, Enchantress From The Stars, and Shade’s Children. Arguably, the last takes place on Earth, but it still encompasses what I generally turn away from in SciFi/fantasy) I’m working in broadening my horizon in that area. Red Rising though….Man, I am so mad I kept waiting for so long. This book was AMAZING. Plus, Pierce Brown is apparently a fellow Potter fan so there is always that. 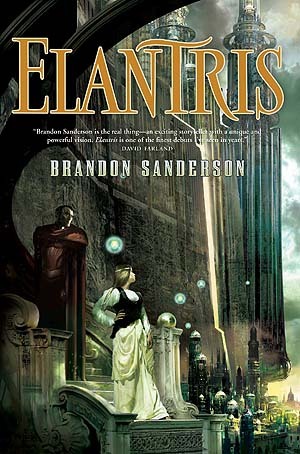 As the image suggests, my first official book for the New Year was Brandon Sanderson’s debut novel, Elantris which was released in 2005. Aside from a short story, this is more-or-less a stand alone high fantasy story with more books possible in the future. From the back of the book: Elantris was the city of the gods. What power could have cursed it? Raoden, prince of Arelon, was loved by all, including the princess he’d never met. Where has he gone? Hrathen, high priest of Fjordell, will convert the people of Arelon or kill them. How will he decide? Sarene, princess of Teod, was a widow before she was ever married. Who can stand against her?